If you have damaged, discoloured or slightly crooked teeth. cosmetic tooth veneers can change all of that by giving a boost in self-esteem. 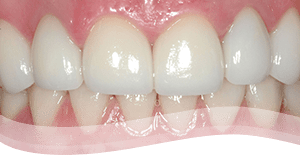 Veneers can also help strengthening weaker teeth that do not already have some form of decay due to the added support of the ceramic shell of a veneer. 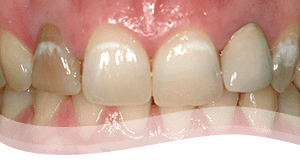 You will gradually have an increasing interest in overall dental hygiene as the value of a well-shaped and lifelike veneer begins to affect your everyday lives. 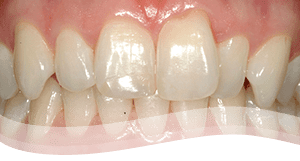 There are also orthodontic benefits to porcelain veneers in that they can provide slight correction to bite patterns and crooked teeth over time without the expense of braces or other procedures that would affect your daily life. 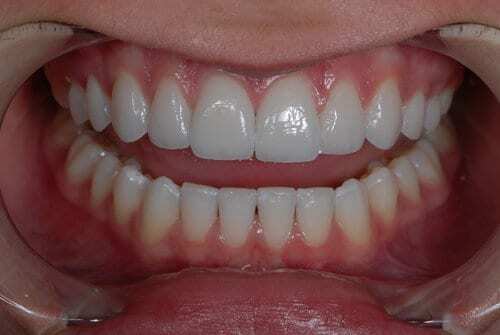 Veneers look more natural than any other restoration. They could easily be mistaken for natural teeth. The porcelain reflects light just like a real tooth. In some ways, veneers are even better than natural enamel. Porcelain will not stain or wear like natural teeth do. Clinical tests show that even years after the veneers procedure, with proper maintenance, your new smile will look just as bright as it did the day the veneers were inserted. The best part is that veneers require little or no tooth preparation. They look like natural teeth and won’t weaken your natural tooth structure. The materials used to make our custom porcelain veneers allow you to dictate the size, shape, and coloration of your new smile. Each porcelain veneer shell is hand-crafted by one of our experienced master ceramist. This allows Dr. Kaviani to provide you with cosmetic restorations that closely resemble the appearance of natural teeth. Our goal is to provide you with a new smile in just two to three visits, without other people being able to tell that you’ve had major dental work. We use specialized veneers procedure to increase their resiliency allowing you to eat a full diet. We use the longest lasting aesthetic cement to attach the veneers, which triples their longevity. 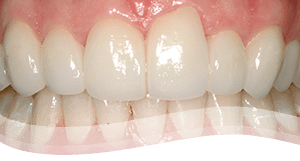 We create the exact colour and translucency that your natural teeth have using natural looking porcelain. After you have consulted with our cosmetic dentist Dr. Kaviani, you should know if you are a good candidate for veneers and can move forward with scheduling the required appointments. There are a few steps involved in the process that requires impressions, creation of the ceramics and prepping of the teeth. The first step in getting a new set of veneers after proving to be a successful candidate is a consultation for x-rays and impressions. Meticulous cosmetic dentists will take this time to sit down and discuss the goals each patient is looking for with their new set of veneers. The next step is called a mock-up, which is a series of images the dentist will create to show the patient what the results will look like. Dentists like Dr. Kaviani will spend considerable time on these representations to ensure the patients will receive the best care and get the desired results. 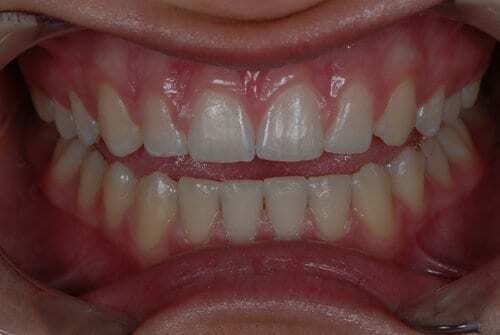 The day of the procedure, the dentist will remove a small bit of enamel from each tooth to create a space for the veneer to adhere to and not impede the patient’s bite. Then a putty mould is created of the teeth with that layer of enamel removed. This mould hardens and will be sent to a lab for the veneer creation. Sometimes , we and can have the veneer impressions created in-house with special 3D mapping technology. Temporary veneers are prepared and applied while the patient waits for the lab to create the permanent ones. 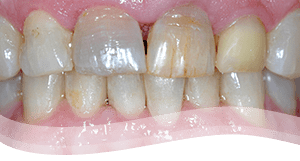 When the permanents arrive, the dentist will apply an acidic gel that dissolves minerals on the surface of each tooth so that there is a rough surface for the veneer to bond to solidly. Cementing the veneers in place is a quick process that involves a special light to speed the hardening process. Once the porcelain veneers are set, they will be bonded to the patient’s teeth in minutes. 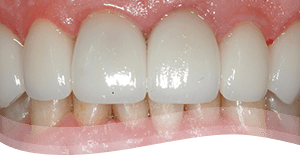 There is virtually no downtime when getting porcelain veneers and at the most, some might feel slight sensitivity to hot and cold food and drink due to the enamel that was removed beneath the veneers themselves. Other than that, patients are ready to flash their new pearly white teeth for all to see. Porcelain veneers tend to last ten years and have been known to last much longer.